Nail designs and patterns are a form of art themselves, but incorporating the art techniques of painting masters into your manicures is always fun. For example, Jackson Pollock is famous for his splattered paintings. You can make that technique look just as good on your hands as it does on canvas. You'll have fun doing it too! 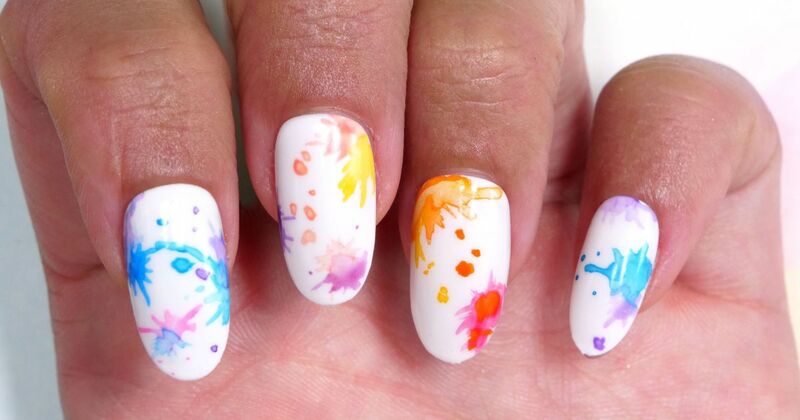 There are quite a few creative splatter styles and methods to try. From blowing out of bendy straws to actually painting the splatters on with brushes, you're sure to turn some heads with any of these looks. For an extra kick, try adding some sequins or glitter. There's something undeniably fun about wearing colors. It's a nice change from the usual day-to-day neutrals, and the application process is a departure from the ordinary too. All you have to do now is grab a bendy straw, choose your favorite bright colors and read the tutorial here. Though you don't get the pleasure of blowing color out of a straw and onto your nails, using a striper brush can be just as effective. 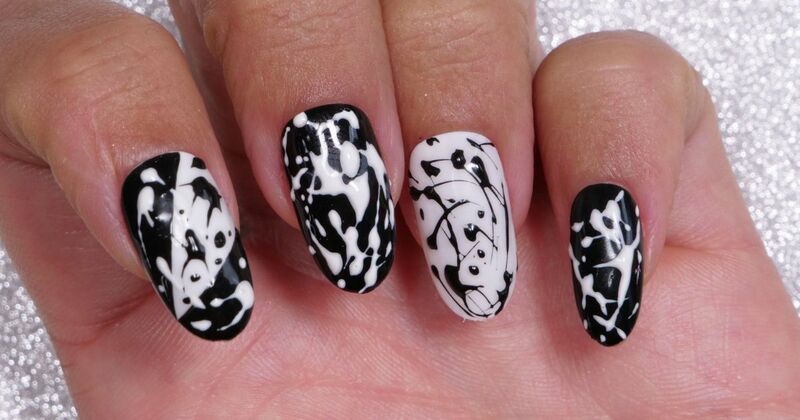 As you can see with this black and white splatter style, using a brush to apply your splotches allows you to place them wherever you want. 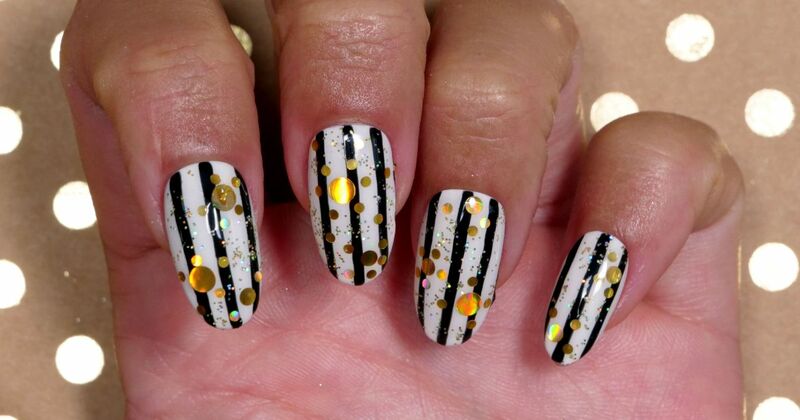 You can even have an underlying background pattern (shown on the index finger here) to add some artistic accents. Read through the tutorial for this look here. If you want to use a lot of color in your next nail look with pastel colors, this is a good substitute. Get the tutorial here. Glitter and gold together give off an upbeat party vibe. They're less about paint splatter and more about bursts of sequins and sparkles that complement the minimal black-and-white-striped backdrop. This look has "good time" written all over it and would be ideal for a night out on the town. Get this look by viewing the tutorial here. Here's another style that's as much fun to look at as it is to paint. Choose how light or dark you want the gray hue to be by mixing as you like. 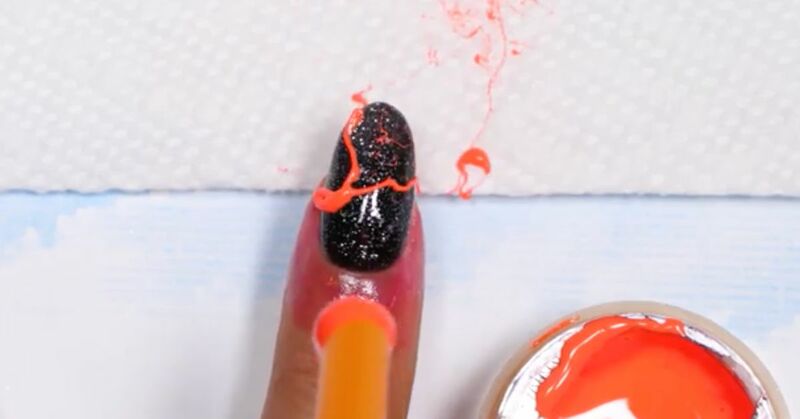 You're also creating a shimmering animal print with the glitter. If you have some black and white polish, silver glitter and a makeup applicator, you're already close to locking down this look. Find out how by viewing the tutorial here. 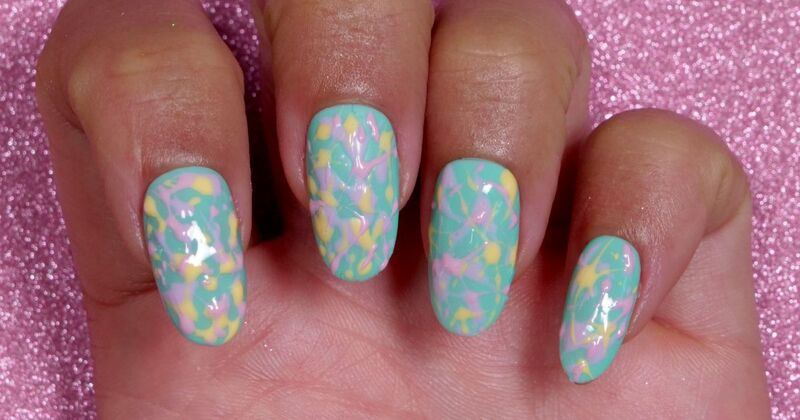 Pastels are a perennial favorite for nails. If you're going for the full-color coverage of the previous soft-hued design, try using the colors as an accent. You get to use actual watercolor paint for this unique design. Get the tutorial here. 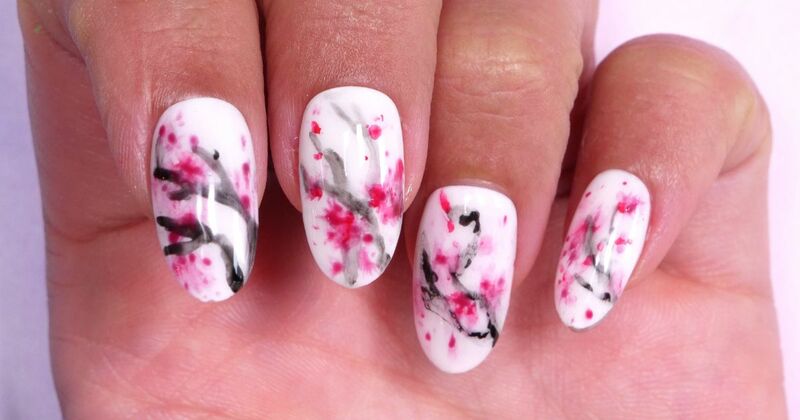 This nod to cherry-blossom season has you using watercolors again, but this time, you're using splatters to make blossoms. Adding little dots of burgundy gives dimension to the flowers. 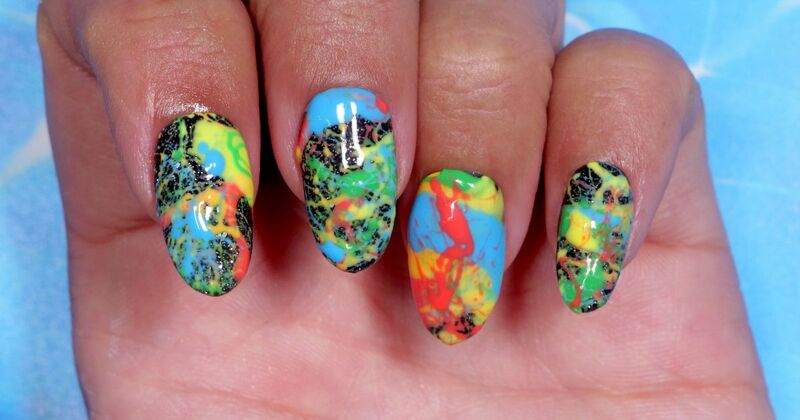 This look is easy to replicate, letting you use your nails as a canvas. Find the tutorial here.